We here at Desert Fire Products having been in business for more then eight years, have always strived to make quality affordable products for our customers. We produce some of the toughest bench rests for your weapons. Some need only the long gun model (LGR-1), others the pistol only version (PR-1). We offer (at present) these two different models to suit your needs. We also sell a pistol adaptor (PDAPT-1) for the rifle only model. Please go to our Products page and find the one that fits your needs. We hope that you find what you need here and if you have any suggestions on how to improve the items, please drop us a line or two. We are always open to suggestions. R.E. Lee (owner and head dishwasher). 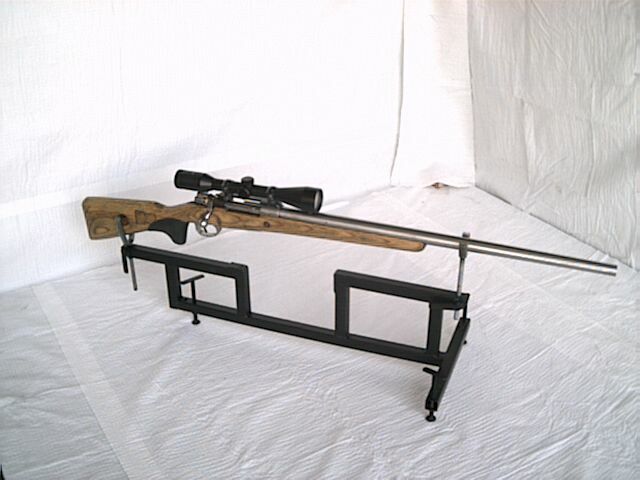 Here is a photo of our Rifle Only Rest (LGR-1) with one of my custom (heavy barrel) 308 Mauser target rifles. Please tell your shooting friends about our website & products.